Since I did not partake in a tour or even attempt to follow a map within the Forbidden City, my photographs were taken purely on what caught my eye. As the day progressed, many entrances were in shadow. 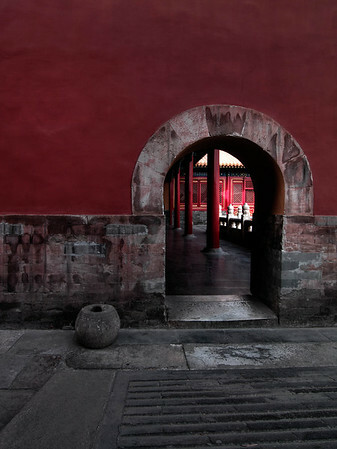 This particular entrance into the courtyard inside, struck me with the simplicity of the design and the red color of the wall above the entrance as well as the red columns and walls inside.